Joe is beside himself with worry about Kerry. He rounds on Amber and asks why she wasn't carted off too. Apparently the police want $200 bail money. He shouts at Amber that he's going to get Kerry and she can stay there and look after the kids. He warns her to treat them like little indigenous animals and to make sure she doesn't put them on the endangered list(!) Then he storms out slamming the door. Two seconds later, he comes back in saying he's changed his mind and is taking the kids to their grandmother's house instead! Todd, Melissa, Josh and Cody come in and Helen offers them a drink. In the kitchen, Helen tells Todd that there's no news from Beverly yet, but she's bound to turn up soon. In the living room, the girls are heading off to do their biology assignment which they'd forgotten about. Josh tells them not to worry - he'll do the work for them. He says all he has to do is use the Thesaurus on the computer to change the keywords. Melissa isn't convinced but the others are game to have a go. Adam comes in and tells her that Caroline has booked him for tonight. Melanie is disappointed - she was coming over to dinner. She decides to go anyway. She babbles about how nice it is to have a man with you in the cinema(!) Adam heads off with Caroline to his great relief(!) Caroline is off to a meeting with Mr Morecambe. 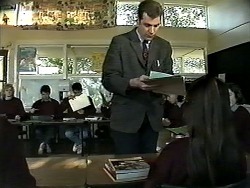 Mr Morecombe comes in at that moment with an arrangement of flowers for Caroline. Joe has arrives home with Kerry. He is very angry indeed about the arrest. KERRY: Where are the kids? JOE: I'll go and get them, they'll be driving the oldies mad. KERRY: Did you leave them with Dad and Madge? JOE: Well, I had to leave them somewhere. Their mother was in jail! Christina and Melanie are having a drink. Christina is still banging on about Paul and how he isn't interested in her. 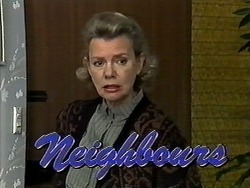 Melanie tries to console her, saying that giving Caroline a bracelet doesn't necessarily mean Paul is in love with her. It's just his way of saying thank you. Melanie says that if Christina is serious, she should tell Paul about her feelings, but Christina says he won't be back from Buenos Aires for weeks. Melanie gets all coy, saying Christina will be hearing from Paul in the very near future. Mr Morecambe is being rather sleazy towards Caroline and Adam is concerned about her. She tells him quietly though that he should just do his job and let her handle things. Joe is glowering in the living room at Amber, who is meditating. Toby asks if there will be photos in the paper of the protest. Kerry, Joe and Amber bicker about Kerry's arrest. Josh has finished the essays for the other three. Todd and Cody are pleased, but Melissa still isn't sure. She says she'll go along with it, but she doesn't like it - their teacher isn't stupid, and will most likely notice the similarities. When the others have gone, Todd and Helen talk about Beverly. Jim has contacted the police, just in case. Mr Morecambe is going on about oysters and being generally sleazy. 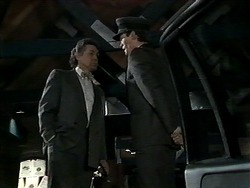 Adam opens the door and tactfully invites him to enter the restaurant. He has a quiet word in his ear too, which viewers don't hear, and nor does Caroline. Christina asks Melanie what she meant by what she said about Christina "seeing Paul soon". Melanie tells her openly that she's written a letter to Paul saying he's treated Christina badly. Christina is horrified - Paul will deduce from Melanie's letter than she's in love with him. 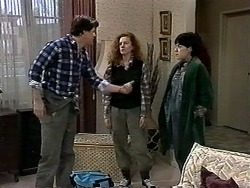 Adam and Caroline have arrived back in Ramsay Street. Caroline says that Mr Morecambe was almost human in the restaurant - what did Adam say to him? Adam says he didn't say anything really, but it's clear he told him what was what. Amber is going on about Kerry's domesticity again and laying in to Joe. Kerry tells her to stop putting Joe down - it's easy to get the wrong impression of him, but he's the kindest and gentlest person she's ever met. Joe overhears this and looks very touched. Kerry goes on to say that Joe was right - he may love his beer, meat pies and footy, but he was concerned about her and the baby getting hurt, and they could have been today. She says he'd do anything for his family - he's not just her husband, but her friend and she loves him very much. Joe looks quite emotional. The teacher is collecting the essays and is rather impressed to see that Cody's is word-processed. 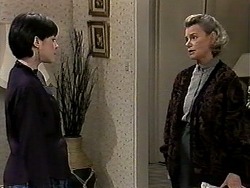 Helen has come to ask Kerry if she has heard from Beverly, but she hasn't. Joe comes in having forgotten his job book, but Kerry spots it in his back pocket. He kisses her tenderly before heading off. JOE: Oh, and one other thing, if you're doing any protesting today, can you drop the kids over at Madge's? Oh, and be careful. And if you end up at the cop shop again, just tell them your husband will be down to pay bail as soon as he can. Thanks darling. Bye! 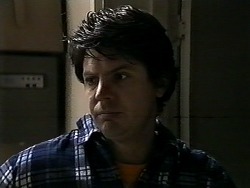 Kerry looks amused and confused at the same time! Todd, Melissa, Cody and Josh are agitated - the school are having a crackdown on recycled assignments on computer. Cody and Melissa are very worried they'll be done for cheating. Adam comes in as Christina is leaving - he's come for his pay for last night. Melanie says that she had a great time with his parents last night, and is going to make them a surprise cake to say thank you. Caroline comes out and tells Adam formally that she wants to talk to him. Caroline tells Adam that she's had a call from David Morecambe - it seems Adam told Mr Morecambe that Caroline was his fiancee(!) Caroline is not pleased, saying she is not some simpering female who needs rescuing. He apologises, and offers to take her out to dinner to say sorry. Caroline is shocked. 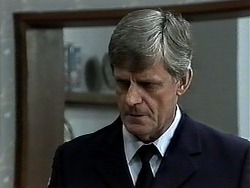 The police have turned up to talk to Jim, but only Helen is there. They ask Helen to tell Jim to get in touch with them urgently.